Whether you use AirPrinting directly from device or emailing the labels information and then printing, it is essential that the printer settings do not change the output from AddressLabels. The app produces a pdf file with all of the addresses in the correct place for the label. However, in some cases, the settings in the printer or the program used to print the emailed file, can be such that the output from the app gets changed, and the addresses do not line up correctly. “I’ll try to explain what I did on my Air Printer HP 5529 photosmart. The HP Photosmart 6520 has limitations working with Apple AirPrint. There aren’t any options to adjust margins, scaling, etc… Using AirPrint, the label alignment starts out, but progressively deteriorates. The solution is to use “HP ePrint”(which has many more options / functions) to print the PDF attachment emailed by AddressLabels. Perfect! Prior to getting and using AddressLabels, I had not used HP ePrint. So I learned something new. 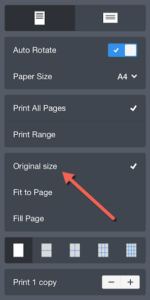 HP ePrint is a great app that has much more functionality than Apple AirPrint. Another user, Lisa, had a similar problem when using her printer. She was also using an HP6520 and HP ePrint. Although this worked last year, it did not this year (2016). Then Lisa found a solution – another app called PrinterPro. So you need to install PrinterPro. Then email the AddressLabels labels pdf to yourself, and open the attachment in Mail, You can then tap the share button (square with up arrow) and select PrinterPro. It is essential that the program used prints the pdf file exactly as it shows on the screen. If the settings are wrong, the computer program might add margins, or scale the output such that the original dimensions are lost. 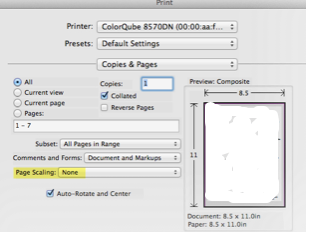 The setting must print actual sixes with no scaling (or scaling set to 100%). On a mac, you will probably use the Preview program to display and print the addresses. If so, ensure that scaling is 100%. Similarly, on Windows, when printing from Adobe, make sure there is no page scaling.